Langham Chicago Wedding Photos // Sam + Pete! 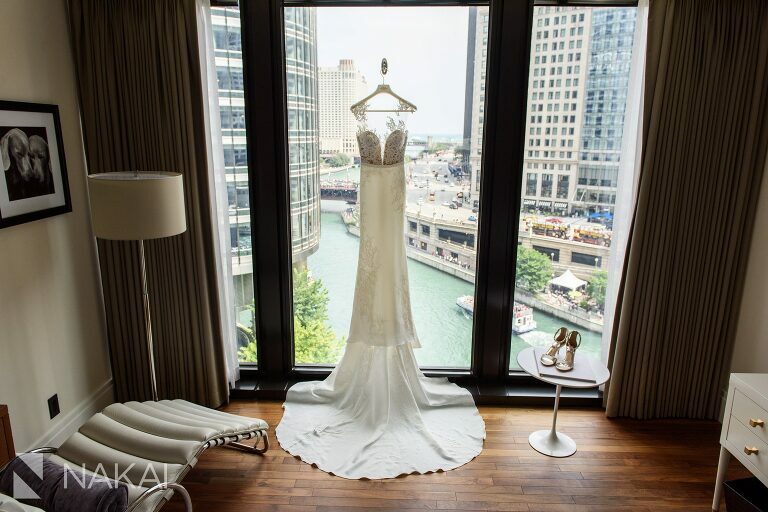 Photos at one of the Best Chicago Luxury Wedding Venue Hotels: The Langham Chicago! 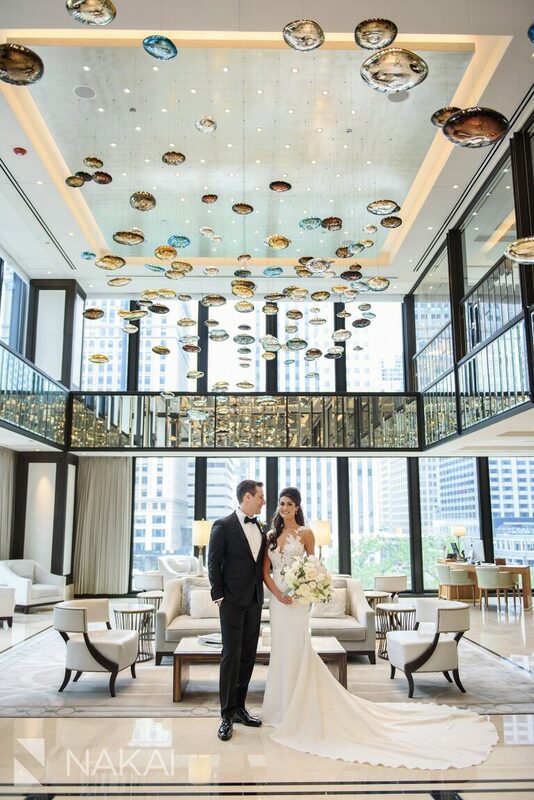 Samantha + Pete were married at one of Chicago’s best luxury wedding venues – The Langham Chicago! I love everything about this hotel…the location, the natural light and the luxurious modern interior design! It totally matched their look for their wedding! Another one of my favorites from the day was taken on LaSalle Street. 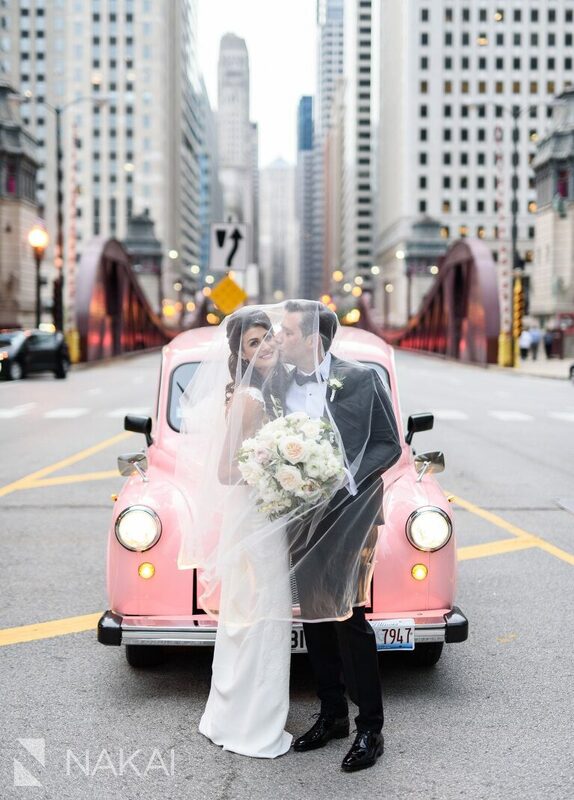 As a photographer, I love all the layers to this photo…the kiss under the veil, in front of the Langham Pink Taxi, and on LaSalle Street with the bridges in the background! BTW: I’m not the only one that loves this photo – The Langham Chicago put this on their Instagram account as well! 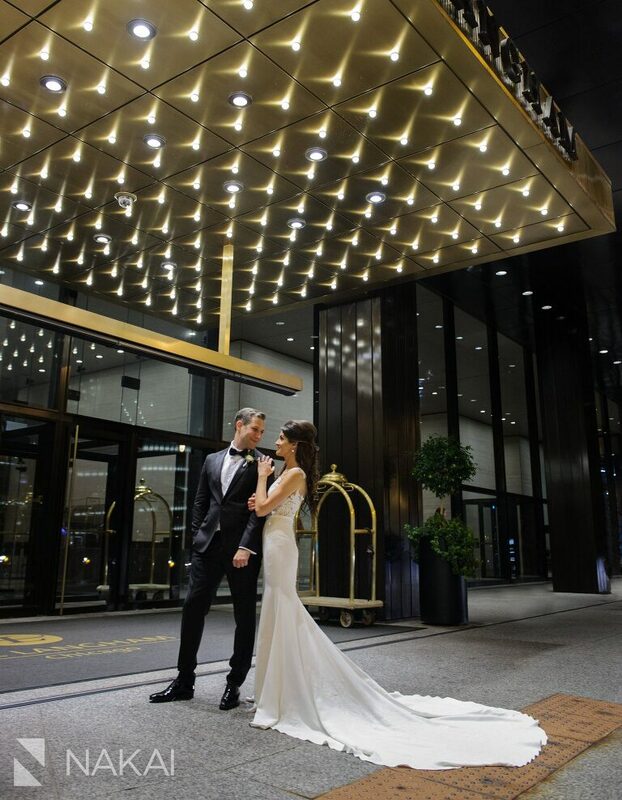 Nothing is more romantic than a photo at night under the Langham Marquee- Her Pronovias gown is perfection! One of the prettiest places to hang a dress in all of Chicago. With the Chicago river in the background! Decided to combine her earrings with her clutch! Love how their initials made it into their branding for their invitations, stamps, and Sugarfina guest favors! And wouldn’t you know, the chocolate was made in Greece – perfect for their Greek wedding! Not a staged photo- this WAS the moment after the bottle was uncorked! Custom fashion illustrated makeup bags for the bridesmaids! The hair and dress were a stunning combination! One of my favorite moments from their day! Priceless reaction with the flower girl! As a photographer, one of the reasons I enjoy working at the Langham is due to the variety of photos that you can take in and around the venue! It is located in one of the best locations and the interior is so photogenic! Photographer’s Tip: Step back and include a sense of place in the photo! We stepped outside for a brief photo on the River with the Wrigley Building in the background! We love the Langham Pink Taxi! If you are ever a guest at the Langham, you can take a ride in it! A bridal party picture with a fashion magazine feel! One of my favorite parts of a Greek Orthodox wedding, when the mothers throw petals at the bride and groom! One the way back to the Langham, we stopped on LaSalle St to take a few photos! Samantha found these vintage wedding magazines featuring famous Greek and American weddings: Jackie Kennedy Onassis + Caroline Kennedy! The Devonshire Ballroom looking fabulous for the reception! One of the best parts of a Greek wedding: the dancing! Confetti toss on the dance floor! One more photo under the Langham marquee! Congrats again Samantha + Pete! It was an amazing day and I hope you were able to enjoy it all over again through these photos! Can’t wait to share more! « Drake Hotel Wedding Teasers // Kim + Samer!